The Art Gallery of Nova Scotia one of the premier arts institutions in Canada and is a gateway for the visual arts in Atlantic Canada. The gallery acquires, preserves and exhibits works of art, and provides education in the visual arts. The Art Gallery of Nova Scotia is the largest art museum in Atlantic Canada; it is an agency of the Province of Nova Scotia and one of the premier arts institutions in Canada. The Gallery is a gateway for the visual arts in Atlantic Canada and is also responsible for acquiring, preserving and exhibiting works of art, and for providing education in the visual arts. Its mandate is to develop a collection, exhibition program, and public program that brings Nova Scotians and visitors in contact with contemporary and historic art associated with the province while also introducing art from across the region, the country, and other nations and cultures. Per Curator Shannon Parker, the permanent collection is now at approximately 18,000 works, 45% of which are prints, 20% are photographs, 13% are drawings, and 13% are paintings, with the rest as sculptures, textiles and ceramics. The collection is managed and maintained by a staff of 23, including education and development staff. Some of the Gallery’s well-known pieces include one of Ms. Parker’s personal favorites, a black and white abstract by the Québécois artist Paul-Émile Borduas, because “the depth and texture and thickness of the paint come alive”; Ms. Parker also values the Maud Lewis “painted house”—the fully restored residence of one of Canada’s most popular folk artists, on permanent display in the Gallery’s Halifax location, making it one of the few galleries to have an entire house in its collection. The Gallery had been using a database system for a number of years to do the basics of collections management, but the vendor let it become obsolete, and procuring a new system to meet the security and infrastructure requirements of Provincial IT became imperative. The old system was computer licensed rather than user-based, with access for only five staff members, so a few people fielded all questions about the collection—and importantly, there was a pressing concern about data loss once the database was unsupported by the vendor. After what Ms. Parker described as a “rigorous procurement process,” they selected web-based Argus, in large part because it offers powerful permissions management and security, provides access for the entire Gallery staff, and supports the organizational mandate to increase public exposure as much as possible. Ms. Parker and her team are responsible for the maintenance and care of the collection— not only as disseminators, but as collectors of information about artists and specific artworks that enhance the experience for visitors. With Argus, files in any format and links to additional information can be attached to each record, easily expanding what’s accessible, without any rewriting or processing—which saves a great deal of time. It’s fair to say that Argus has increased efficiency for many Gallery employees: can check for copyright and see if something is under the public domain without having to call the curation staff. Batch updating options (e.g. location) and lexicon control are “fantastic,” enabling curators to make changes in ten minutes as opposed to the hours it used to take. And with Argus’ mobile capabilities, curatorial staff can work with the collection via tablets or smartphones wherever they are, whether from off site storage, from home, or while roaming the Gallery. 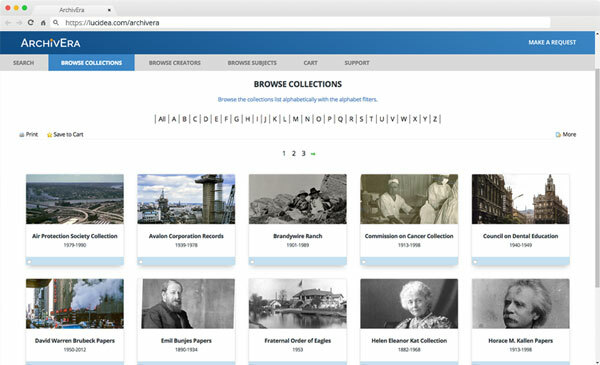 Development staff (fundraising, public relations, graphics) can leverage dynamic saved searches which are especially useful for the social media campaigns, and Gallery docents go through weekly training with the curatorial staff who direct them to curator-written documents with expanded information about objects that are linked to records—enhancing their ability to guide and educate visitors. Once the Gallery releases their Argus public portal, virtual visitors will be able to see if artworks they wish to view are on exhibition, and they’ll enjoy an intuitive, visual experience with the ability to save favorites, and utilize pre-set searches developed by the curation staff. Ideally, says Ms. Parker, visitors will one day be able to search the portal from within the Gallery—perhaps using loaned tablets—and leverage expanded content and components that accompany specific objects, possibly incorporating audio. In addition to “ticking all the boxes” for Gallery and IT requirements, Argus was the most cost efficient for data conversion and implementation. And per Ms. Parker, “The Client Services Team was with us throughout the entire conversion—always hands on and responsive—and is always available to us post-process. That kind of relationship is important and it works out well across time zones.” The Art Gallery of Nova Scotia now enjoys an innovative collections management system that will always be perfectly suited to their needs and the preferences of its public audience, even as those needs flex and change over time.